This recipe is a winner! I made these at holiday time and they were a HUGE hit. 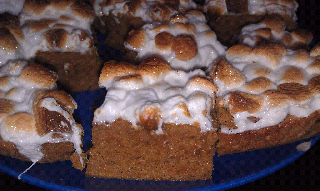 I am not a fan of marshmallows on my sweet potato casserole but on this bar they make all the difference. The bar itself is dense and moist and the crunchy marshmallows really bring it all together. I used Organic canned Sweet Potatoes, 1 med sweet potato scrubbed, baked and cooled will work as well. Either way you need 3/4 cup! Preheat oven to 350 degrees. Line an 8x8 inch baking dish with foil, and spray with cooking spray. Cream the butter and sugar at medium speed until light and fluffy, 3 to 5 minutes. Add the eggs, one at a time, scraping down the bowl as needed. Mix in the vanilla and the salt, cinnamon, nutmeg, and ginger. With the mixer on low, slowly add the flour, and mix until just incorporated. Using a rubber spatula, fold in the sweet potato puree.